GIF is the standard file format to use when it comes to animated images although there are newer alternatives such as MNG and APNG. Basically an animation is created by playing a sequence of frames very quickly to get the desired result. If you would like to extract a particular frame from an animated movie, it is actually quite easy without the use of a third party tool by pausing the media player, pressing the Print Screen button on your keyboard and pasting it to Paint or Microsoft Word. Trying to do that on an animated GIF image can be challenging because you can’t pause the animation to take the perfect screenshot. An example is an animation of a text file containing a list of premium accounts that scrolls really fast which is impossible to read. If you’re looking for ways to extract frames from GIF, here we have 5 different methods that can help you to split a GIF animation into individual frames. IrfanView is an excellent image viewer software that is fast, small, and free. It is way better than any of the photo viewing software that comes in the Windows operating system. 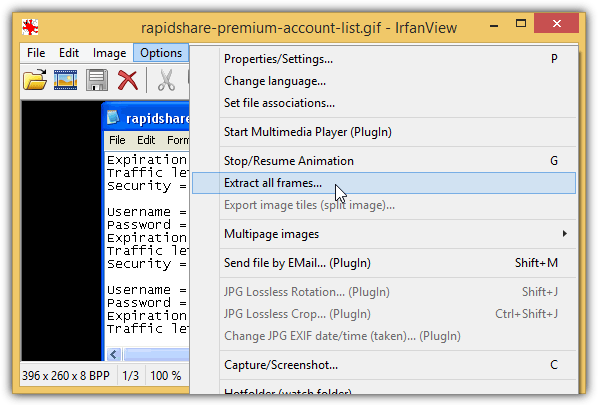 Other than just an image viewing software, IrfanView is capable of creating panorama images, capturing screenshots, JPG lossless rotation and crop, adding effects, image editing functions, and extracting frames from an animated GIF. After loading the images into IrfanView, go to Options > Extract all frames. Browse the destination directory where you want to save all the extracted frames to and optionally choose the image format from the 20 different extensions. Extracting all the frames may not be the best solution if you are dealing with a GIF file that has a few thousand frames. What you can do is press the G key on your keyboard to pause the animation and followed by pressing the C key to capture the screenshot of that frame. If you’re looking for a free command line tool to extract frames from an animated GIF file, ImageMagick is your choice. ImageMagick consists of multiple free command line tools to create, edit, compose, or convert images that supports over 100 formats. You only need to use the convert.exe program from the ImageMagick suite to extract all frames from an animated GIF. A vcomp100.dll file is also required to be in the same directory as the convert.exe to work. The command line above will extract all frames from animation.gif file to the same directory with an additional underscore and increment number added to the end of the filename. Do take note that the -coalesce option is important to save each extracted frames as full frames or else you’ll only get the differences between frames. You might have heard of FFmpeg from a codec pack and it contains libraries to record, convert and stream audio and video files. Although ImageMagick can do the job, FFmpeg is more suited to handle big animated images with thousands of frames that can cause ImageMagick to crash. You’ll need to use the executable ffmpeg.exe from the bin folder with the command line arguments below. The output filename will be accompanied with an incremental number up to a maximum of 5 digits. This will mean that %05d from the example command line above can output up to 99999 files. If you have an animated GIF file that has over a hundred thousand frames, then you’ll need to change %05d to %06d. 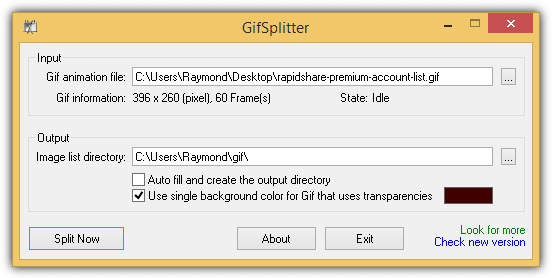 If command line tools are a bit too advanced for you, here is a no-brainer, really easy to use, small and portable freeware called GifSplitter that can automatically extract all frames in an animated GIF file. Simply download, extract and run the program. Choose the GIF animation file and select the output folder. The first checkbox is useful to automatically save the extracted GIF frames into a new directory. The second checkbox is only useful when the animated GIF has a transparent background and you’d like to replace the transparent background with a color. Obviously the easiest and fastest way to extract frames from an animated GIF file is through an online web service. This saves you the trouble of downloading any software to your computer or making sure that the command line arguments are correct. Simply visit ezgif.com on your web browser and either upload the animated GIF from your computer or specify the URL and click the Upload button. Once the GIF file has been uploaded, click the “Split it!” button and each frame will be displayed at the bottom of the webpage. At the end of the output, you can download all the extracted frames in a convenient ZIP file. 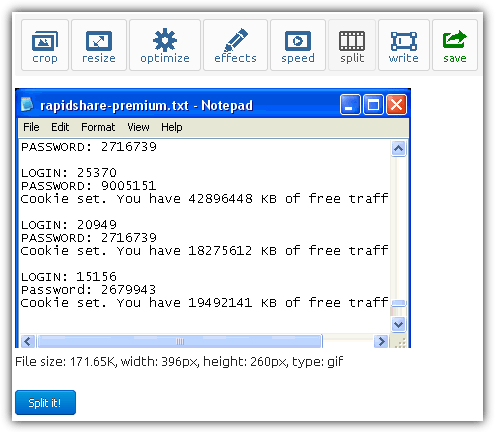 Some of the useful features found on ezgif.com are the ability to change the animation speed, crop, resize, compress, add effects, and embed text over GIF. Thanks. Very helpful. FYI, a disadvantage of GifSplitter is that the frames into which the GIF is split are in .BMP format. These are very large, resulting in a total size approx 15x the size of the original gif. Also, if you wish to reassemble a selected group of frames into another GIF, you can use FastStone.exe (also free). But that reassembles only single-image files in (single-frame).GIF format, not .BMP. JPG, or PNG. Note, FastStone also splits up animated GIFS, but if there are more than a few frames, it takes forever. Just found an easier way to do this and you can do it on webpage directly. So if you use Chrome, you don’t need to download those software, download the gif before you actually split or break a gif. Check it out chrome.google.com/webstore/detail/gif-frames/khkbfocobajjjkojjgpmnhdgbmlnlnef . Yeah! Good job, i really need tool like this!